Zhang Yi，is currently Concertmaster of the Guangzhou Symphony Orchestra，National First-Class violin player. 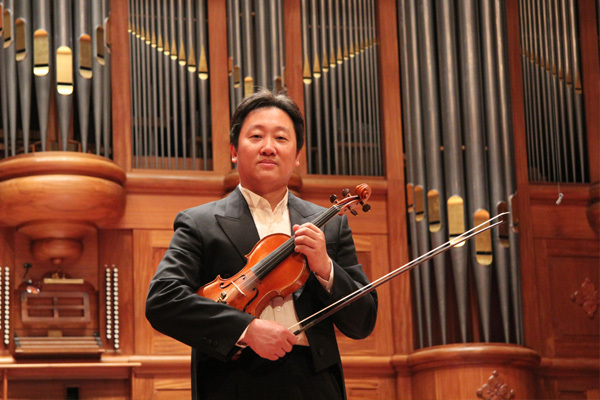 Zhang Yi joined the GSO after his graduation from the Xinghai Conservatory of Music in 1990, and took up the position of Concertmaster with the GSO through successful audition in 1997. In August 1998, as a delegation member of the GSO, he was invited to join a “united orchestra” in Japan with musicians from seven visiting orchestras in Asia and Australia/Pacific area, and gained critical acclaims. Subsequent performances have taken him to USA, Austria, Germany, France, Italy, Switzerland and many cities in China. As the Concertmaster and soloist, he has performed with many of the leading artists and celebrated conductors in many successful concerts. Zhang Yi has been the recipient of the “Excellent Musician of the Guangdong Province” from the provincial government for four times in 2003, 2006, 2007 and 2011. He has also attended master classes by renowned violinists such as John Harding and Joseph Silverstein who highly praised Zhang Yi’s performance. He served as the jury of National Violin Competition of the 6th Chinese Golden Bell Award for Music in 2007 and the String Quartet Competition of the 8th Chinese Golden Bell Award for Music in 2011. Mr. Zhang is also a guest professor at Xinghai Conservatory of Music in Guangzhou. Currently, he is Vice President of Guangdong Violin Education Society, Vice Chairman of Guangzhou Tianhe District Federation of Literature & Arts Community and Vice Chairman of Guangzhou Performing Artistes Guild. He has appeared to perform numerous solos of movie and television music productions, released more than ten CDs for solo and ensemble music with critical acclaims. Zhang Yi’s solo album “Sentimental String (1)” on Pacific Audio & Visual label received the 3rd National Excellent Audio and Visual Prize; the “Sentimental String (2)” won the 2nd China Golden Disc Award for Best Small Ensemble. Another award winning album “The Heavenly Tibet” was named 2010 Top Ten Best Violin Album in China.